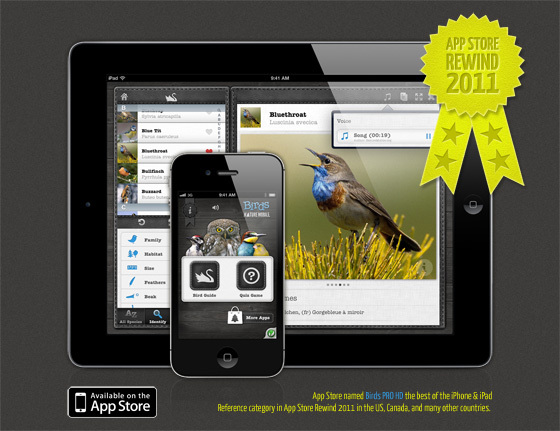 App Store named Birds PRO HD the best of the iPhone & iPad Reference category in App Store Rewind 2011 in the US, Canada, and many other countries worldwide. NATURE MOBILE: Birds PRO – stylish and easy-to-use BIRD IDENTIFICATION GUIDE with an integrated PICTURE and SOUND QUIZ GAME. Read fascinating information and learn facts about 230 common European bird species; browse more than 1500 PROFESSIONAL PICTURES of birds; listen to more than 460 spectacular CALLS AND SONGS.